I've uploaded a new build with some of the fixes I thought I included in my last update . And I really have started the documentation..... Expect a first cut shortly. I introduced two new piece's of functionality eek.... sorry. You can edit the list and include only the ones you want to show, optionally including a maximum value. ie. Im hoping the pain of a final (I promise) change will make things simpler for clusteroverview. Sometimes things go wrong... Sometime I make mistakes... I admit it. To help me clear up those little issues debug information is essential... Previously to obtain this data you needed to edit the start up file. To simplify this process I've included a -debug option for the command line. So if you encounter some strange behavior, try turning this on first... Who knows it may solve the problem. if it still isn't obvious copy the text and contact me... I'll do my best to sort it out. Just finished a new build of TraceAnalyzer... I've uploaded it to the downloads page. Let me know if you have any problems here or on the comments page. New build of Trace Analyzer nearly done as well. 4 CPUs with Dual Cores (hyper threading enabled). The point here is that the hardware was low end but with the ability to deliver plenty of CPU and I/O at very attractive price point. For those that aren't that interested in any more of the details the headline figures where that we performed full table scans at over 1.6GB/sec but due to compression we achieved logically three times this figure. 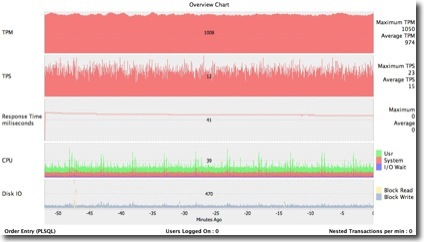 We used the deadline scheduler to improve I/O prioritisation. Multipath was used to provide DMP over the 4 paths to disk from each of the servers. Two parallel instance groups to ensure execution of certain queries on a given node. ASM was used to provide storage for the datafiles etc. Each physical tray of disk was presented to ASM as logical disk of roughly 500Gb. ASMlib was used to persist disk identity and simplify configuration. The tests consisted of a series of SQL statements that were run serial, concurrently and as a series of streams. I cant give much in the way of specifics for obvious reasons but the machine ran at about 80% utilization during the test most of the queries returned sub minute when run against the full data and many sub second when materialized views were exploited. However the real benefit came from the fact that low the cost commodity hardware made the system relatively cheap and easy to put together. Like any system there were things we would have liked to have done differently if we'd had the chance... The benchmark was done in 10 days (OS Install, disk, layout, Oracle install, data load etc.) and so things were done in a rush and with a little more thought could have been done much more efficiently... We are fairly certain we could have improved the I/O performance but we didn't have the luxury of experimentation and so we made a call and lived with the consequences... I strongly recommend that any one building one of these systems spends some time with Oracle Orion disk benchmarking system to determine an optimal layout. A recent customer evaluating several possible disk layout configurations showed over 100% difference between two subtly different versions. 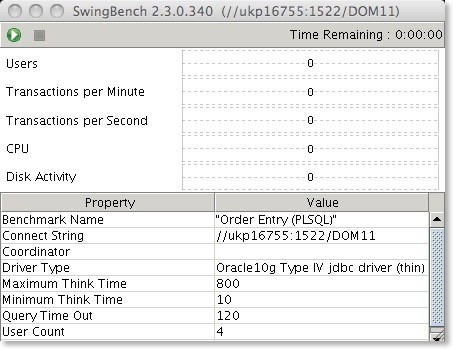 I managed to break minibench in my last update of swingbench 2.2. I've uploaded a new build and taken advantage of the opportunity to refresh the libraries. Sadly this will mandate 1.5 as the new JVM. Apologies if this causes any inconvenience. I've just added a pdf containing an overview presentation of Swingbench here. I've also uploaded some viewlets to give you a feel for how Swingbench looks in 2.2 and and 2.3. Expect more soon. •	Add a new emp/dept default config file. So I finally managed to find time to fix a few bugs inside of datagenerator. •	Build number now shown in title bar. I've updated 2.3 (I told you I'd be patching regularly) to include new command line functionality for charbench and a few fixes to some of the benchmarks. I've replaced the old command line options of -vc,-vt, etc. with a more flexible option. you can now choose to list as many or as few metrics as you desire. Displays the time of the reading, users logged on, transactions per minute, transactions per second, cpu, disk, and dml operations. Adding the -rr option (refresh rate) allows you t change the speed of update. Will update the reading every second. So I've finally got enough of swingbench 2.3 finished to feel confident I can at least show you where I am There's just one or two things I need to include before I can feel confident that I can take it out of beta. But before I tell you what those are let me tell you what's new. So expect more frequent releases over the next few days. So if your interested join in and I'll do my best to keep it informative and entertaining. I've backported some functionality from 2.3 to 2.2. This enables the user to specify the runtime for swingbench from the command line. I've also added a new command line option to specify a login delay from the command line as well. This is useful for throttling back connections for large numbers of sessions. I've also recompiled 2.2 with a 1.4 JVM to support backwards compatibility. Its not easy keeping an idea on all aspects of swingbench and sometimes I let stuff get through that really shouldn't. I try my best. I made a amateurish mistake on sequence numbers in the order entry bench. I've uploaded a new build of 2.2 which I'll include in the new 2.3 build shortly. If you find these annoying little bugs or potentially big issues drop me a line and I'll do my best to put it right.